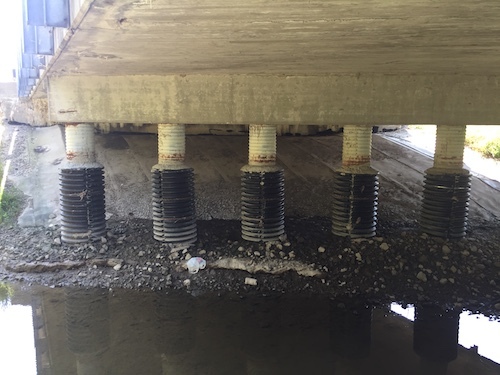 In September 2015, the Ohio Department of Transportation (ODOT) found that flood flows were causing erosion of the foundation slope near the columns below a two-lane roadway bridge on Ohio State Route 579 in Toledo, Ohio. This area also was exposed to runoff from bridge drainage. ODOT considered lining the slope with riprap, but access to the slope was limited and the department did not want to disrupt traffic on the two-lane road. The option to add vegetation to the slope also was considered, but it was deemed impractical because of the excessive shade under the slope that could prevent it from growing and would require continued maintenance. The maintenance division had the responsibility of constructing the repair, which had already been designed incorporating Concrete Cloth geosynthetic cementitious composite mats (GCCMs) by EMH&T and Ohio State University (OSU) through a grant from the ODOT Research Div. Dan Mecklenburg, an ecological research engineer in the School of Environmental and Natural Resources at OSU, helped the crew interpret the designs. Before using GCCM, flood flows caused erosion. GCCMs provide an efficient permanent or temporary covering solution to address slope protection issues. By using a GCCM, concrete can be used on slopes, in water and other hard-to-reach places with no molds or mixing and minimal equipment. GCCMs can be used to protect slopes as a replacement for shotcrete, riprap and other hard armor systems. GCCMs are fabricated with a three-dimensional structure that reinforces the concrete, providing strength and durability, while employing less material than conventional concrete methods. The material is easy to install, requires limited equipment and less freight, can be used by standard maintenance crews to quickly cut and secure it in place. GCCMs can act as an effective weed suppressant or can be used in conjunction with surrounding vegetation. The fabric can be installed quickly with limited disruption to onsite operations. Maintenance involves hydrating the material as opposed to removing forms around poured concrete. Once hydrated, the material cures quickly to form a rigid, durable and water-resistant concrete surface. It will remain flexible for up to two hours and can be easily manipulated to fit the contours of irregular installations. For larger jobs, installation rates as high as 20,000 sq ft per day are achievable. The flexibility in design allows the engineer and installer to adjust layouts and details as each project requires. The area also was exposed to runoff from the bridge. The surface underneath the overpass was restored prior to the GCCM’s installation by smoothing out the repair area and removing any large rocks and clumps of earth that would inhibit the GCCM from being able to lay flat on the slope. The maintenance crew hand-prepared the slope by raking it, and once the surface was ready, the rolls of material were cut in an area near the bridge, carried underneath the overpass and laid in strips longitudinally on the slope. The only part of the project that required lane closure was when a water tank was brought in to hydrate the material, which closed one lane of the bridge. According to Mecklenburg, the bridge’s low clearance would have made it difficult for alternative repair methods, such as riprap, to make it into the work area. Similarly, any equipment needed would have been hard to maneuver in such a small working area. This project was a trial run for the ODOT’s use of a GCCM to see if the material would fit the department’s needs. Since its completion, the department has used the material to repair other slopes under bridges throughout the state and to line culvert inverts for protection. Almost three years after the repair, the GCCM underneath this specific bridge is holding up well and protecting the slope from erosion as it was designed to do. The structure and performance of GCCMs help extend the ability of municipalities, counties and transportation departments to effectively repair slopes more efficiently and at a lower cost than other methods. Less material and ease of installation means faster installation and project completion, with fewer traffic disruptions when compared to traditional concrete repair and construction methods. Ultimately, overall project costs are reduced, easing the strain on infrastructure budgets. With these qualities, the performance of the GCCMs in the ODOT project shows that GCCMs are a best practice for maintenance issues involving slope protection. Excessive shade under the overpass would have prevented vegetation from growing. John Hepfinger is global market manager for Milliken. Hepfinger can be reached at [email protected] or 706.302.4476.